What kind of business wants customers to buy less? The beef business, or at least, one tiny corner of the beef business. Mark Shelley is an environmental film-maker turned cattleman who raises grass-fed beef near Carmel, California. The methods he and many others have adopted make beef far less environmentally damaging than industrial methods. Quite apart from anything else beef is, as Mark puts it, “the big elephant in the room” when it comes to climate change. 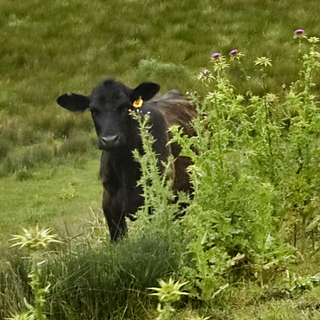 Anything to address that ought to be welcomed, and grass-fed beef is far less damaging. It does, however, cost more, not least because we’re all paying the external costs of industrial meat. That’s fine, Mark says. We should all be eating better beef, just doing so less often. How to make that happen? Mark has no idea, he’s just doing his bit, one piece of meat at a time. Mark’s recent visit to Italy offered the chance to find out more. I completely forgot to ask him about the drought. Tassajara Natural Meats has a website. I reckon they’re too busy taking care of the cattle to take much care of the website. Photo by Carrie Cizauskas, used with permission. You may remember that ages ago Eat This Podcast talked about the benefits of frozen beef. I fully agree, less but better meat! Enjoy NYC and be as proud of your award as I am!